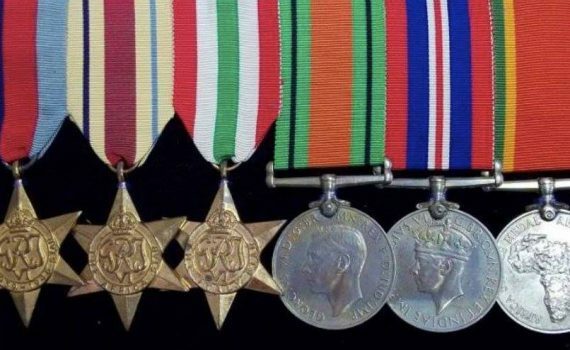 Understanding your Grandfather’s (or Fathers’) World War 2 medals. 1. The 1939 – 1945 Star – campaign medal awarded to all British and Commonwealth personnel who fought in any theatre of operations during WW2. The ribbon shows arms of service – Navy (dark blue), Army (red) and Air Force (light blue). 2. The Africa Star – campaign medal awarded to all British and Commonwealth personnel who fought in African theatre of operations. The ribbon is distinguished by the “Sahara” sand colour). 3. The Italy Star – campaign medal awarded to all British and Commonwealth combatants who fought in the Italy theatre of operations (distinguished by ribbon in the colours of the Italian flag). 4. The Defence Medal – campaign medal awarded for both Operational and non-Operational service during WW2 to British and Commonwealth service personnel (and civilians involved in Service to armed forces). The ribbon is symbolic of the air attacks on green land of UK and the Black out is shown by the two thin black lines. 5. The War Medal 1939-1945 – campaign medal for British and Commonwealth personnel who had served full-time in the Armed Forces or the Merchant Navy for at least 28 days between 3 September 1939 and 2 September 1945. The medal ribbon is distinguished by the colours of the British Union Flag/Jack. 6. The Africa Service Medal – a South African campaign medal for service during the Second World War, which was awarded to members of the South African Union Defence Forces, the South African Police and the South African Railways Police who served during WW2. The ribbon represents the Two Oaths taken (red tab for Africa Service Oath and the later General Service Oath) and the green and gold colours of South Africa. 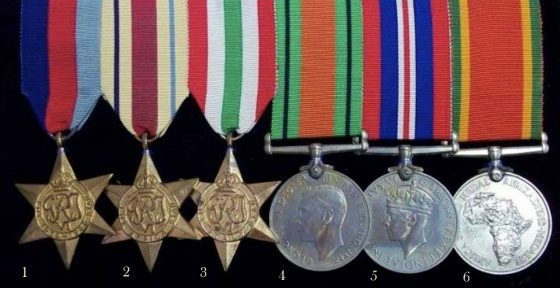 Have a look at your Grandfather’s or Dad’s medals (or your Mum/ Grandmother’s) and see if they are in the right order and which of these six medals you now recognise. Note: This is a very complex field and the intention is to show the basic outline, each of the medals has rather extensive qualifying criteria.